On Tuesday, Aug. 4, the Tewksbury Police Department will be joining forces with thousands of communities nationwide for the “32ndAnnual National Night Out” crime and drug prevention event. National Night Out, which is sponsored by the National Association of Town Watch, will involve over 16,124 communities from all 50 states, U.S. territories, Canadian cities and military bases around the world. In all, over 37.8 million people are expected to participate in “America’s Night Out Against Crime”. One of the goals of NNO is to strengthen neighborhood spirit and police-community partnerships. 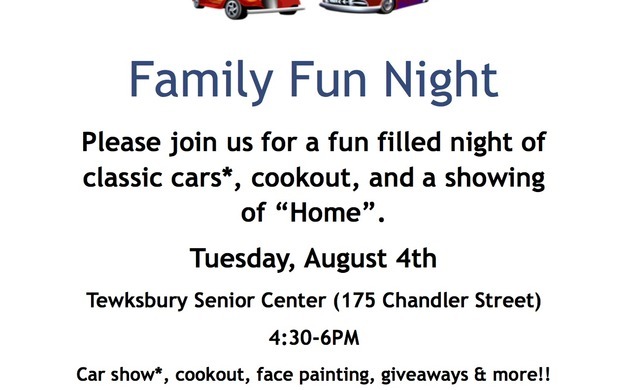 The Tewksbury Police Department, in partnership with the Tewksbury Senior Center, Tewksbury Board of Health and the Tewksbury Public Library, will be hosting a FREE “Family Fun Night” starting at 4:30PM. There will be a classic car show and free cookout thanks to the Peregrine’s Landing, Tewksbury Walmart, and the Knights of Columbus. DJ Jaryd Palmer will be providing musical entertainment. Parking for this event will be at the State Hospital with shuttle service to the Senior Center. Following the car show, please join us inside for the movie “Home” on a big screen with popcorn, snacks and drinks. If you are planning on coming for the movie portion only, please try to arrive by 6PM so that you can get your refreshments and seats. The movie will start at approximately 6:15PM. This FREE family night was made possible by our community partners and the generous donations from Big Top Party Rental, Altitude Trampoline Park, Enterprise Bank, Community Teamwork, INC, Tewksbury Credit Union, Tewksbury Fire Department, Tewksbury United Methodist Church, Upper Merrimack Valley Reserve Corps, RTN Credit Union, Lowell General Hospital, Green Meadows Preschool, Patriotic Committee, Tewksbury Rail Trails, Merrimack Valley Pavilion and Tewksbury State Hospital. In case of rain a smaller version of the event will be set up inside the Senior Center so please come on down. For more information or to get involved, please contact Officer Jennie Welch at (978)851-7373 EXT 230.